At least 260 people have been killed and 60 injured in an oil pipeline blast in Nigeria's commercial capital, Lagos, Nigerian Red Cross (NRC) officials say. Officials say they are still counting bodies and it is feared the death toll could be much higher. 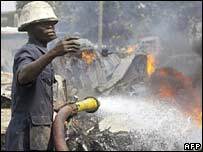 The blast in the Abule Egba area happened as hundreds of people were scooping fuel from a pipeline punctured by thieves, officials said. Some 2,000 people have died in similar incidents in the past decade. NRC officials said they had counted 260 dead so far, adding that efforts to recover the bodies were being hampered by the intense heat. "We can only recognise them through the skulls, the bodies are scattered over the ground," NRC's Ige Oladimeji was quoted by the Associated Press as saying. Akintunde Akinkleye, a Reuters news agency photographer at the scene, said he had counted about 500 bodies. NRC secretary general, Abiodum Orebiyi, told the BBC that a number of houses had been destroyed, along with a mosque and a church. He said the blaze had now been brought under control. Some of those injured in the blast are believed to have gone into hiding to avoid arrest. Others may not have gone to hospital because they lack money to pay for treatment. Lagos journalist Adeyinka Adewunmi witnessed the aftermath of the explosion. "The pipelines are in a popular neighbourhood, very close to the express road, which I normally use for my journey to work," he told the BBC News website. "I could see fire, state ambulances, ambulances of the Red Cross, firefighters, government officials. There were scores of dead bodies on the ground and injured people being carried into ambulances. "I heard officials saying that the nearby hospitals were full." Despite being Africa's largest oil producer, Nigerians often suffer fuel shortages because of corruption, poor management and infrastructure problems. Pipelines often pass through poor communities, who break them to steal the fuel. "There hasn't been a regular oil supply in Lagos for more than a week now," said Mr Adewunmi. "This has led to people's agitation and some poor people have become determined to get fuel by all means, including by bursting the pipes."